Spam and other messages with harmful content are costly to your organization. 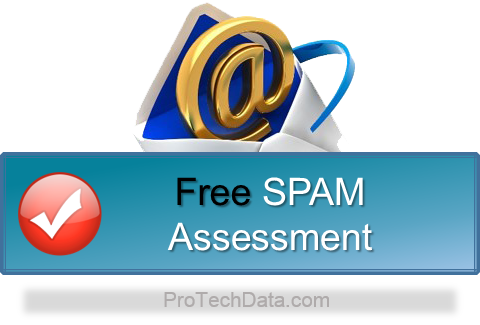 SPAM decrease employee productivity and increase security risks and legal liability. ProTech Data Managed Email Service provides immediate, real-time threat detection without any maintenance and hardware, or software operating cost. At a fixed monthly fee you benefit from the speed, control, and security and flexibility provided by an internal device or cloud based services or a hybrid of the two. We provided comprehensive anti-spam, anti-virus, and content filtering, as well as email spooling and hosted messaging continuity services. Keep your business up and running by filtering all inbound and outbound messages where threats are blocked and quarantined before they reach your network or client’s network. In addition, through content-based filtering, emails can be automatically blocked based on key words, senders, or attachments, providing an additional layer of end user protection. Stop spam, viruses, spyware, and phishing attacks, all at the same time, providing users with the email reliability your small business requires.